Nautilus Construction specializes in Additions, Remodeling, and New Home Construction. Change the look and use of your kitchen by changing cabinets and counter-tops, or by remodeling the entire kitchen. Transform your bathroom into a space you can enjoy and relax in! Add detailed mill-work, trim and built-ins to rooms in your home to create a more custom look. Increase your home’s efficiency with new windows and doors, or with a complete exterior makeover that may include new siding, decks and roofs. Looking for someone to manage your entire building project? 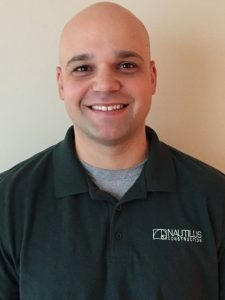 Use Nautilus Construction as your general contractor. We’ll make sure everything gets done right and on budget. Small home improvement projects and maintenance. Design, plan, and produce all project documents, as well as build and warrenty your project with one point of contact. Office fit-ups and construction management. Our team takes a customer first approach to each of our projects, big or small. This starts with open communication and collaboration. We listen to our clients wants and needs, and help them obtain the most value in their project. From the start we help align your dream to match your budget. Professionalism and top notch quality work is our first priority! We stand by all of our work, and build things correct the first time to protect your investment. We recruit and work with the best subcontractors who share the same pride in their work. Our subcontractors also exert the same level of professionalism, attitude, and cleanliness to make the building process as enjoyable as possible. We want your renovation project and custom home build to be an experience that you enjoy. Trust is achieved through communication and openness. You will know what to expect and how much everything costs at all times. Please view this clip to see how this is achieved. When choosing the right contractor for your project your choice should be based on skill, service, references, and then on price. Partnerships are built, and overall you need to ask yourself will I enjoy working with this person for the next few months or year? Many home owners try to force their dream into a budget that is to small and decide on a contractor based on the lowest price. In the end, they will go through a painful process that results in an inferior product.